It's been dry out lately, so Riley gets to go out at night on a "sleepover" with Harv. He comes in and drops like a stone for a few hours. Grazing, it seems, is hard work! My Chance likes to nap too. 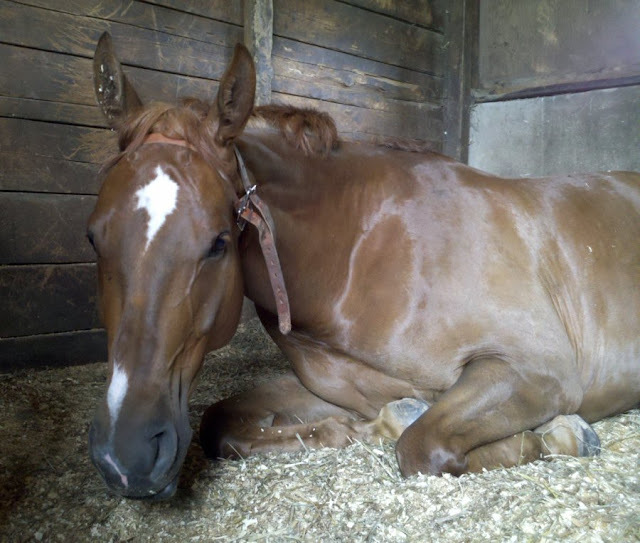 My horse seems to love when I catch him sleeping, because it makes it so I can reach to scratch all the good itchy spots, behind his ears and along his poll, etc. He gets very vocal in his groans of pleasure and cracks me up. Hee! I love seeing the bits of bedding in his ears. You know they've slept well when. . . .
Hey, look at how Riley's front hoof is on his chest? Do you think that Harv could be doing the same thing, but it's aggravating his chest?